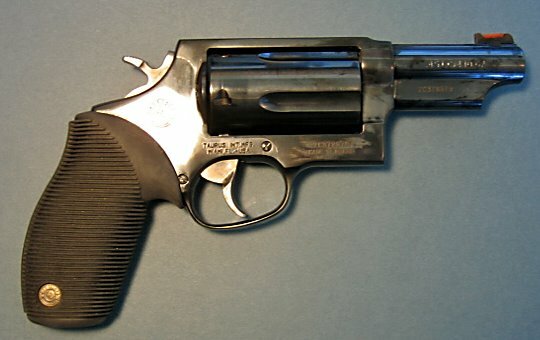 This is a weird looking revolver and while Taurus classifies it as a hunting arm, it seems to me that it would also make one darn good home defense handgun. While this revolver is pretty strange looking it also looks like it means business. She sports a 2.5 inch barrel with fixed sights at the rear and fiber optic red at the front. The revolver has the Taurus rubber grips which are hands-down the best revolvers grips produced today. What makes the gun strange is the elongated cylinder which is capable of handling 5 rounds of .45 Colt or .410 shotgun shells. 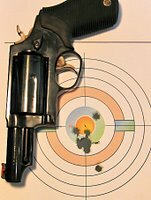 This makes for some interesting home defense scenarios when examining the options afforded by this revolver. 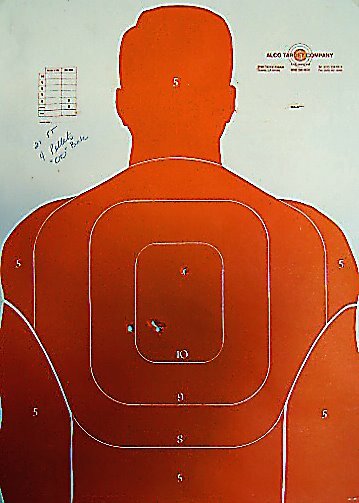 At first I thought that the way to go would be something like the first round containing #4 shot with the remainder loaded with the .45 Colt cartridges. The best way to look at these possiblities is to examine the targets. Here is ten rounds of Winchester 225 grain Silvertip Hollowpoints fired at 21 feet.  The accuracy is great and the cartridge is certainly capable of dispatching those who would invade your domicile to plunder and cause injury to your family. However, when shooting inside a residence one must be concerned with over penetration through your intended victim or shots going wild and breeching a wall or door and injuring a family member. This is where the .410 shotshell provides an option. 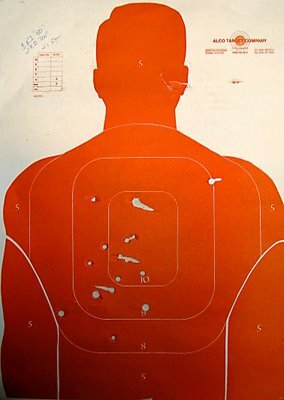 There are those who feel that #4 shot is the way to go if you are pressed into shooting inside a home. 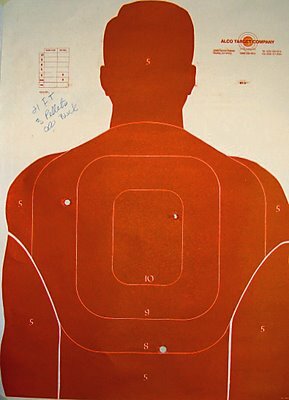 The shot is lethal at close ranges, but not likely to over penetrate or penetrate a wall or door. 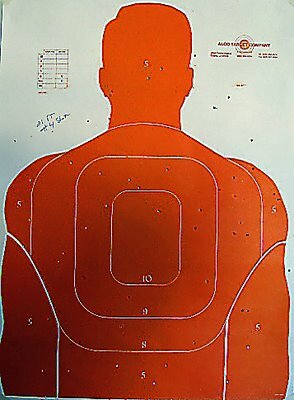 Here is one round of#4 shot fired at 21 feet. The revolver was aimed at center mass and most of the shot went into the torso with 4 going into the left ear and face and six missing the target. Here is one round of #4 shot fired at 10 feet. I realize that this is difficult to see but at 10 feet all pellets hit the torso with none missing. Here's another option. This target shows one round with four pellets of 00 buck fired at 21 feet. Two of the pellets grouped together in the 10 ring with one close by in the nine ring and one further up in the same ring. 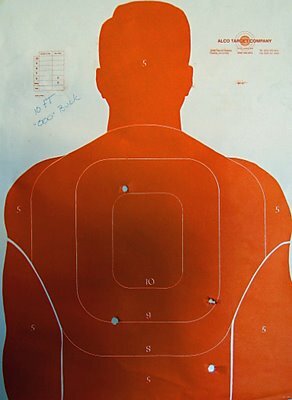 Here is one round of 00 buck fired at 10 feet. The four pellets have hit with in a nice line across the bottom of the 10 ring. Here is yet another option. 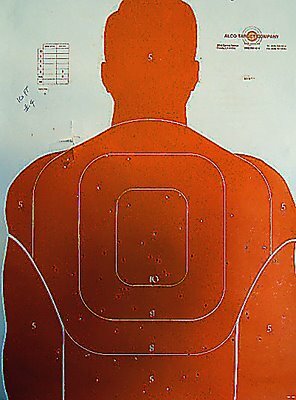 One round of three pellet 000 buck fired at 21 feet. The holes are larger with two in the 8 ring and one in the 10 ring. Here is the 000 buck at 10 feet. 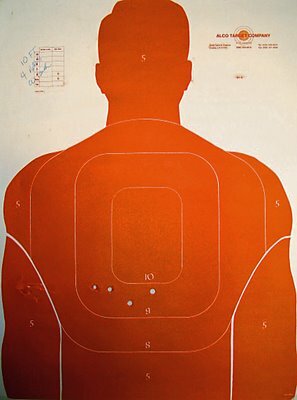 Two pellets in the 9 ring, one in the five ring and the wad from the shell penetrated the target at the right side of the 9 ring also. I call this last one "unleashing the hounds". It is two rounds of 000 buck and three rounds of 00 buck and the results are devastating. I like this revolver. It is easy to shoot and provides many options for protecting your home and loved ones. Plus, it can be found for about $350.00 which makes it a home defense bargain.